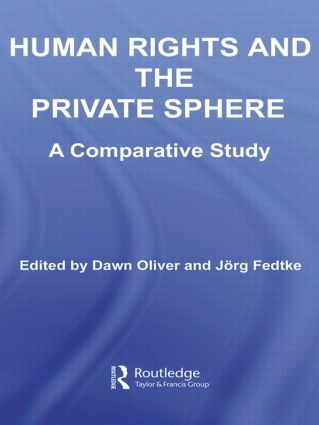 Particularly valuable for both academics and practitioners, Human Rights and the Private Sphere: A Comparative Study analyzes the interaction between constitutional rights, freedoms and private law. Focusing primarily on civil and political rights, an international team of constitutional and private law experts have contributed a collection of chapters, each based around a different jurisdiction. They include Denmark, France, Germany, India, Ireland, Israel, Italy, New Zealand, the UK, the US, the European Convention for the Protection of Human Rights and Fundamental Freedoms and the European Union. As well as exploring, chapter by chapter, the key topics and debates in each jurisdiction, a comparative analysis draws the sections together; setting-out the common features and differences in the jurisdictions under review and identifies some common trends in this important area of the law. Cross-references between the various chapters and an appendix containing relevant legislative material and translated quotations from important court decisions makes this volume a valuable tool for those studying and working in the field of international human rights law. Ireland Irish Constitutional Law and Direct Horizontal Effect – A Successful Experiment?